It's not always a question of "whodunit?" Sometimes there's more mystery in the why or how. And although we usually know the unhealthy fates of both victim and perpetrator, what of those clever few who plan and carry out the perfect crime? The ones who aren't brought down even though they're found out? And what about those who do the finding out who witness a murder or who identify the murderer but keep the information to themselves? These are some of the mysteries that we follow through those six stories. Lots of fun for Austen lovers! Colin Dexter’s Chief Inspector Morse - the cranky, heavy-drinking, and exasperatingly brilliant sleuth of the Thames Valley Police - has become one of the most beloved detectives in fiction. Now, with this collection of 11 short stories, we can savor choice examples of his dry wit, devious cunning, and psychological insight at its best. Colin Dexter tantalizes us with six Inspector Morse adventures, ranging from bite-size morsels of intrigue to longer stories for listeners to sink their teeth into. The setting itself is elemental P.D. James: the bleak coast of East Anglia, where atop a sweep of low cliffs stands the small theological college of St. Anselm's. On the shore not far away, smothered beneath a fall of sand, lies the body of one of the school's young ordinands. He is the son of Sir Alred Treeves, a hugely successful and flamboyant businessman who is accustomed to getting what he wants - and in this case what he wants is Commander Adam Dalgliesh to investigate his son's death. Although there seems to be little to investigate, Dalgliesh agrees, largely out of nostalgia for several happy summers he spent at St. Anselm's as a boy. No sooner does he arrive, however, than the college is torn apart by a sacrilegious and horrifying murder, and Dalgliesh finds himself ineluctably drawn into the labyrinth of an intricate and violent mystery. Here P.D. 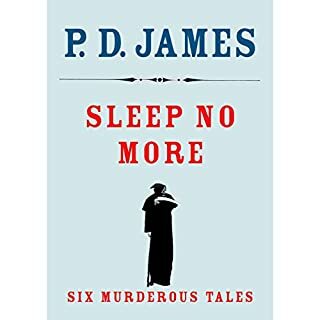 James once more demonstrates her unrivaled skill in building a classic detective story into a fully realized novel, gripping as much for its psychological and emotional richness as for the originality and complexity of its plotting - and, of course, for the horror and suspense at its heart. 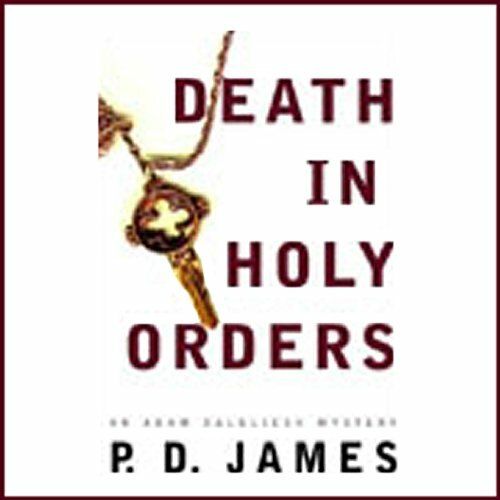 Filled with unforgettable characters, brilliant in its evocation of the East Anglian scene and the religious background against which the action takes place, Death in Holy Orders again offers proof, if proof were needed, that P.D. James is not only the reigning master of the crime novel but also, simply, one of the finest novelists writing today. ©2001 by P.D. 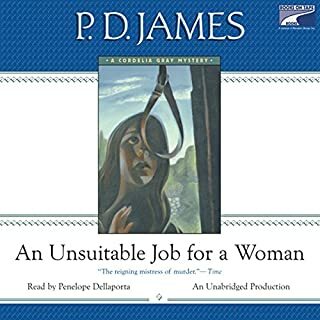 James (P)2001 Random House, Inc., Random House AudioBooks, a Division of Random House, Inc. I chose this title because I have enjoyed the Adam Dalgliesh stories on PBS' Mystery, and I wasn't disappointed. 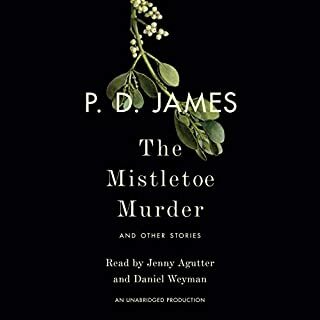 P D James is able to convey atmosphere and suspense in the locale and in the characters, so that I was able to envision the story as it unfolded. It may not have the breakneck speed of some American suspense stories, but it has it's own pace and remains true to it's path. I was not disappointed in the ending as others were - one of the traits of a good mystery is to give enough information for the reader to follow the trail along with the detective. Unpredictable twists that defy logic can ruin a mystery. 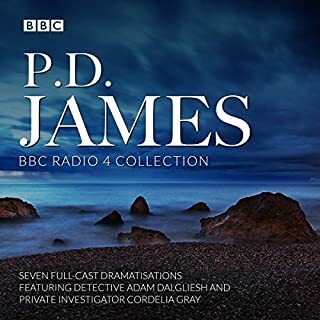 I would love to see more PD James titles available, unabridged, please. This is the best audio book I've heard. The narration is excellent, perfectly paced for the subject, with great accents. The plot and characterisation sustain interest throughout. 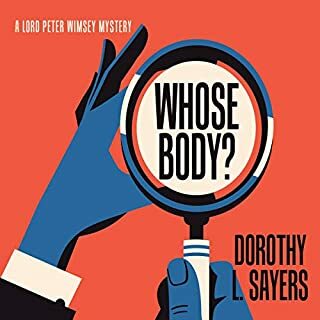 This was my first audiobook crime novel, and it kept me happily entertained for many hours while nursing a sick animal. I found it surprisingly sensitive, intriguing at every turn, so descriptive that I can still SEE the setting, and the plot carrot was always held within reach so I didn't get left behind. It was fun to turn the book off for a while and think about it before going back for more. An engrossing experience. -not for fans of bubbly Stephanie Plum et. al. mysteries. Not literary enough to be a dense listen, but not fluff either. This is very traditional British in mood (if that can be called a mood), as much about the setting, character and social relations as whodunnit- more details of a room's furniture or the sand along the beach than the fullness of a character's lips or breasts. I liked the slow careful narration style-not many or varied voices, but more a book that is "read." This matched the precise and descriptive prose. The story winds along like the East Anglia coast and slowly uncovers what's hidden. 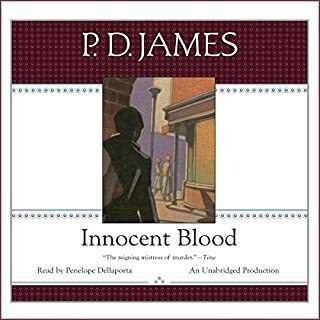 This was my first PD James but not my last, even though I am not much of a mystery fan. Don't read this book if you don't care for masterfully written descriptions so alive that you can 'taste the air'. Avoid it if you don't care for a cultured British accent or a narration that is 'smooth as silk'. If mystery wrapped in suspense and punctuated by murder is not your thing...back away. Otherwise, dive in and enjoy! This is a wonderful read!! It is that good. Wish Simon Preble had read it but he didn't. Terrific book enhanced by Charles Keating's brilliant narration. Keating never gets in the way by over-acting, yet subtly imbues the various characters with distinctive personalities. One of my favorite ever narration jobs. I listened to this unabrigded audiobook during my daily commute back and forth to work. The story started out slowly and took me awhile to really get caught up in it. Part of that, I think, was due to the narrator. His voice never really drew me in and almost seemed irritating at times. Eventually, though, the plot started to move more quickly and I was sucked into the mystery. I really wanted to find out "whodunit" by the end, and there were so many reasonable possibilities! This was my first Inspector Adam Dalgliesh novel. I didn't love the characters, but they were intriguing enough that I'll probably search out more in this series. With a different narrator, I think I would have enjoyed this book more and felt more involved with the characters. Next time I'll try a text version and see if that makes a difference. ... just enjoy her elegant writing. P.D. James is eloquent in describing the brooding poet, Detective Adam Dalgliesh as he tries to discover who murdered an Anglican seminarian. At some point everyone is a suspect (which must be a requirement in English murder mysteries).